long time, it can lead to violent cases of revenge, like you may have seen in the news. Many people who are bullied a lot as kids grow up with low self-esteem and all sorts of other problems.In other words, it’s very important to deal with bullying and not let it ruin your life! Okay, so there you are, and someone is bullying you. What do you do “in the moment”? Ignore the bully. Pretend you didn’t hear him. Don’t even look at him. Walk right past him if you can. Don’t cry, get angry, or show that you’re upset. That’s the bully’s goal. Don’t give her the satisfaction. Even if you’re feeling really hurt, don’t let it show. You can talk about or write down your reactions later. Turn and walk away, or run if you have to. Remove yourself from the situation. Go to a place where an adult is present. Remember that you are not the one with the problem. It’s the bully who has the problem. If you’re being called names or teased, try “The Fog Tank.” Imagine that you’re inside a huge fish tank filled with white fog. Then, imagine that the insults are swallowed up by the fog before they reach you. Nothing touches you. Practice by thinking of the worst things a bully can say to you, then letting the fog eat them up. If you’re being bullied again and again, there’s one “Most Important Thing” you should do: Talk to an adult. This is so important, we’ll say it again. Start with your parents. It’s not “tattling”. It’s asking the people who love you to give you help when you really need it. If the bullying happens at school, make sure your parents discuss it with a school official, not with the parents of the bully. If you feel you can’t tell your parents, or your parents don’t give you the support you need, talk to another adult you trust: a teacher, principal, school counselor, or someone at your church or synagogue. If you feel you can’t talk to anyone, try writing a letter about what’s happening. Keep a copy for yourself and give it to an adult you trust. If you don’t want to talk to someone alone, bring a friend, sibling, or parent. It especially helps to bring someone who has seen the bullying. Make it clear to the adult that you are really upset by what’s going on. This is especially true if the bullying is “verbal bullying.” Many adults don’t take verbal bullying seriously, but the truth is, this is the kind of bullying that can hurt the most. I think Fujitsu’s concept devices have figured out what consumers really want. Last week, we reported on the hybrid notebook/tablet that can fold into quarters, and now this touchpad keyboard. Clearly, customization is key for this touchpad keyboard. Some users prefer that ergonomic keyboard with the split diagonal setup, while others prefer the traditional method. This allows the user to pick the type of keyboard that he or she wants. All in all, it looks like something that could help out those who love the numeric keypad but don’t have it on their laptop. It also looks like it would come in handy for when changing language layouts is an issue. Not that I’ve ever had that problem, but in the age of “there’s an app for that” consumers want a lot more freedom on their personal electronics. Hey girls I am sorry nothing has been posted in a while and umm I am back and will be trying to do more posts then I have been doing. Please check out the Ask Ashlyn page and the Poems written by Haley and we hope to have lots of subscriptions before summer starts and we will be having a FREE contest more details on that will be up soon! 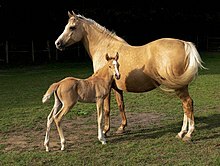 A palomino mare with a chestnut foal. This golden shade is widely recognized as palomino. Saleen S7 Twin Turbo – A Race car for the Street. The new Saleen S7 Twin Turbo has a whopping 750 horsepower! The car is said its aerodynamics would enable it to actually drive on a ceiling upside down! With doors that open towards the skies and unbelievable looks this race car for the street is sure to impress!